At the Azenio Business Center, you can easily and swiftly rent offices, conference rooms and a business address. You can also make use of our secretarial and telephone services. The contract durations of our business center are flexible and tailored to your needs. Here at the Azenio Business Center in Eschborn, our reliable and motivated staff will perform all necessary secretarial duties. Our friendly and efficient secretaries will answer all calls in your company´s name. Your mail will be forwarded according to your instructions: via mail, e-mail or fax. 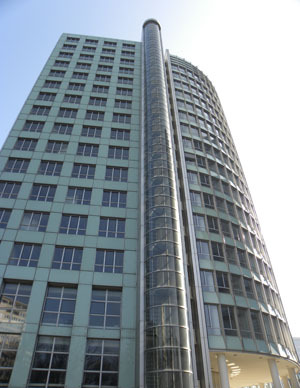 The Azenio Business Center is located in an excellent and popular business area with a beautiful view of the Frankfurt skyline and the Taunus mountains, situated in one of the newest and most modern buildings in Eschborn. In the summer, you can spend your break on the terrace and enjoy the fresh air of the Taunus. Restaurants, hotels, and shops can be found nearby. 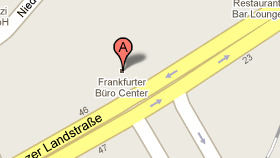 It only takes you 15 minutes to reach Frankfurt Airport or Frankfurt Main Station. In the bright and pleasant ambience of the Business Center Eschborn you can set up your subsidiary without any initial investments. You can rent one or two offices for your market entry until you find your personal office area. You can also use one of our offices occasionally in addition to your home office. Our conference room at Azenio Business Center are the perfect place to welcome customers and hold meetings. Maybe you want to use our secretarial services for writing a letter in Spanish or sending an E-Mail in Russian? Don't hesitate to take advantage of our secretarial services in order to save time and fully concentrate on your business. You can take advantage of our services at the Business Center immediately - for hours, days or a year.We are happy to welcome you in our Business Center to show you your new office or to introduce you to your new secretarial team.